According to Timco Worldwide, a quality produce provider in the United States, there are upwards of 10,000 varieties of tomato plants grown worldwide for canning, cooking, fresh eating and other uses. The best varieties for growing in the southern United States, and specifically in South Carolina, are those varieties that are humidity tolerant and crack resistant. Viva Italia tomato plants grow beautifully in the hot and humid South Carolina climate. These plants produce plum-shaped fruit that are deep red at maturity. These tomatoes are great for cooking and particularly perfect for ketchup, soups and salsa with their sweet, tangy taste and beautiful red color. Viva Italia tomato plants vigorously produce an abundance of fruit with an average weight of about 3 ounces per piece. Plant seedlings deep enough to completely cover the roots and provide stem support. Stake the plants or use wire cages to support them once they have produced fruit. Water the plants as necessary to keep the dirt moist. Voted the number-four best tasting heirloom tomato in a Los Angeles event called Tomatomania, Sun Gold is a type of cherry tomato that ripens to a beautiful, golden orange color. 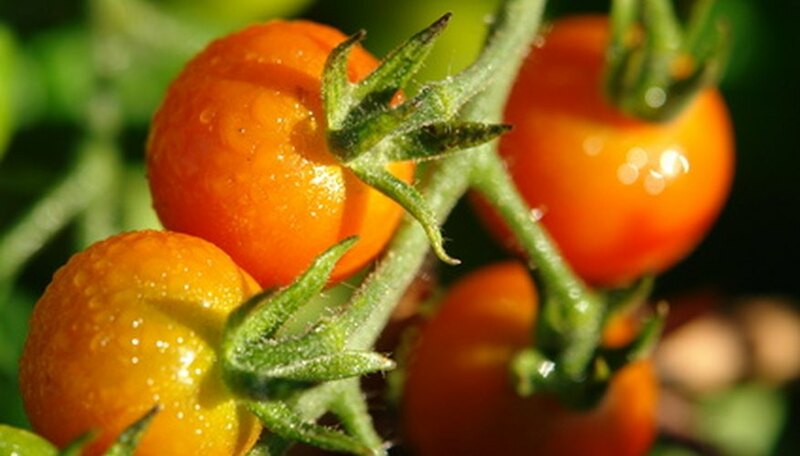 Sun Gold tomato plants produce 1/2-ounce fruit vigorously and heartily throughout the warm months. This variety of tomato produces fruit that tastes citrus and sweet. The intense fruity flavor of this tomato makes it a perfect combination with grape tomatoes in a salad. Plant Sun Gold seedlings in rich soil several inches deep, until the roots are deep enough to be completely covered with the soil. Stake the plant early to prevent it from falling over once it has produced fruit. Water the base of the plant as necessary during dry weather to keep the soil moist. Goliath tomatoes are one of the best varieties of tomatoes to grow in the warm and humid climate of South Carolina. Goliath tomatoes get their name from the giant foliage and huge fruit that they produce. This variety is an early producer that vigorously produces bright red fruit right up until the first frost of the season. Fruit from this tomato generally reaches 1 to 2 lbs. in weight, but it is not unusual for this variety of tomato to produce fruit weighing a whopping 3 lbs. each. Goliath tomatoes are a hardy and disease resistant breed full of tangy and sweet flavor. Plant Goliath seedlings several inches deep; the roots must be completely buried beneath the dirt. Be sure to stake Goliath tomato plants before they have produced any tomatoes, since the fruit of this plant is heavy. Water the plants as necessary to keep the dirt moist during dry weather conditions. Fine Gardening: What’s the Best Tasting Heirloom Tomato?